Still hesitant to pick up strange calls? DU Caller accurately recognizes incoming calls by taking advantage of the world’s largest phone number database. DU Caller also prevents spam and scam calls while protecting against leaks of private data and financial information. ★ Caller ID – Identify unknown numbers before you answer the phone: Say goodbye to telemarketing, scam, fraud, sales, ads, harassment, illegal gambling, loan, insurance, voice phishing, survey research, customer care! ★ Call Blocker – Block all the calls you don’t like. 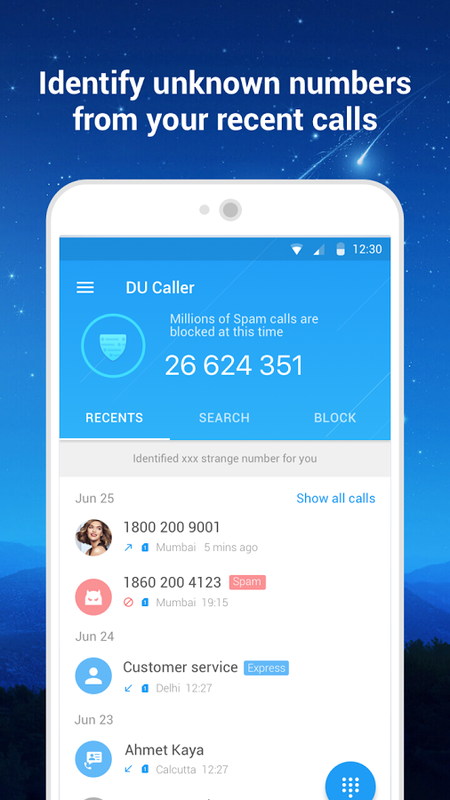 Only one click to block spammers, unwanted calls, annoying phone calls. Or you can greate a personal blocklist which include numbers you don’t want to pick up. ★ Call History Scan – DU Caller scans each strange number for risk to protect your security. ★ Search Online – Enlarge your contact with more than one billion numbers. You can search any name or number you want and find who he\she is! ★ Secret Calls Protection – hide your secret calls with perfect technology. ★ Smart Dialer – The newly added keyboard in Du Caller enable you to take a call with more convenience. When you launch DU Caller, it will scan your recent call history on your phone immediately and then let you know if anything with risk was found. See your recent calls and search any number you like. Then add block numbers to the block list. The left hand menu will allow you to adjust your settings for further blocking features like refusing common spammers, hidden and international numbers or those that are not in your contacts. 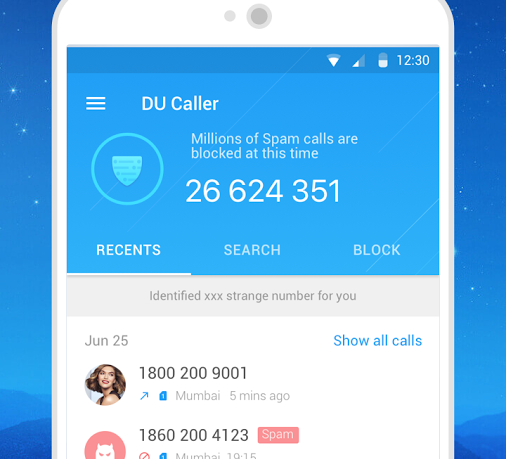 DU Caller isn’t just for scanning strange numbers and blocking unwanted calls. The app can also hide your secret calls automatically with private contacts to protect call privacy. Then there is the Life Assistant built-in with handy numbers like restaurants or repair places in the area. Aside from some typos here and there, the app is easy to use and designed with a functional, straight-forward navigation any user can appreciate. DU Caller: CallerID & Recorder is aimed to protect your privacy but also provides multiple useful features that anyone can use. The app is currently available for free in the Google Play store. Why is the app only recording my side of a phone call? On playback I am only hearing myself. Please advise.